As Brightonians we’re used to gawping at the monolithic spectre of the West Pier, but not everyone can say they’ve paddled around it and raised a pot of dough for worthy causes. Paddle Round The Pier has been an annual fixture since 1996 and has developed a growing international reputation as one of the most offbeat and fun fundraisers around. It’s grown into Europe’s biggest free beach festival, with urban and street sports, live music and kid-friendly antics all adding to the atmosphere. 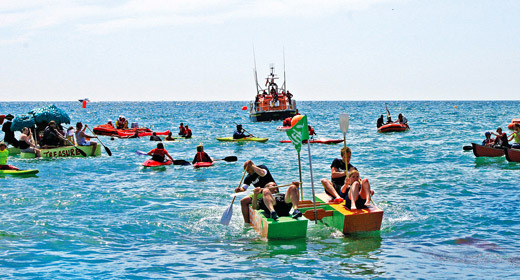 From serious paddlers with kayaks and bodyboards to floating fools atop barely-seaworthy beds and front doors, there are buoyancy options for all in the voyage around the pier’s circumference, as well as a stand-up paddleboard race, a seriously knackering two-mile pier-to-pier Malibu board race and a full-blown sailing regatta. 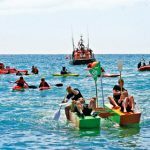 But you don’t have to get even a big toe wet if you’re a committed landlubber – there’s plenty going on across the weekend with a definite dry-land emphasis. Urban and street sports combine to provide a schedule of events where experts risk alarming limb damage via the perilous disciplines of skateboards, bikes and the ultimate thrill-seeking fix of parkour.